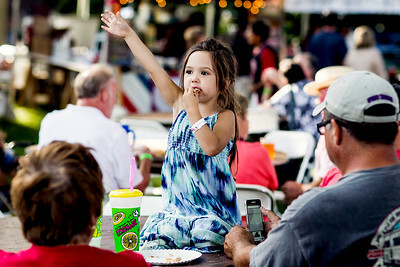 Sarah Nader - snader@shawmedia.com Haylie Hoffman, 4, of Lake in the Hills eats with her family while attending the 37th annual Lakeside Festival on Thursday, June 30, 2016 in Crystal Lake. 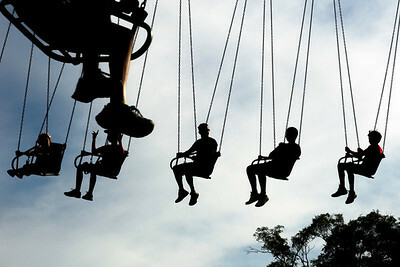 The festival runs through Sunday and features, carnival rides, music, food, drinks and more. 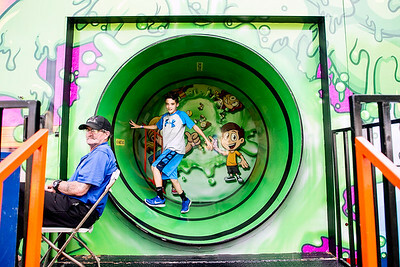 Sarah Nader - snader@shawmedia.com Rogan Reicher, 11, of Lakewood exits the funhouse while attending the 37th annual Lakeside Festival on Thursday, June 30, 2016 in Crystal Lake. The festival runs through Sunday and features, carnival rides, music, food, drinks and more. 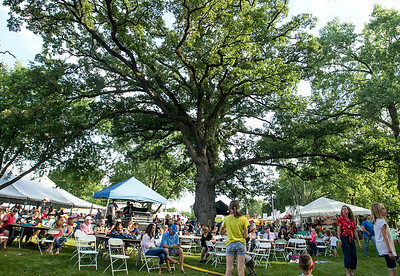 Sarah Nader - snader@shawmedia.com The swing is packed while people enjoy the 37th annual Lakeside Festival on Thursday, June 30, 2016 in Crystal Lake. The festival runs through Sunday and features, carnival rides, music, food, drinks and more. Sarah Nader - snader@shawmedia.com Kids scream while on a carnival ride during the 37th annual Lakeside Festival on Thursday, June 30, 2016 in Crystal Lake. 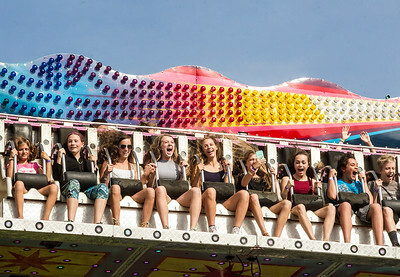 The festival runs through Sunday and features, carnival rides, music, food, drinks and more. 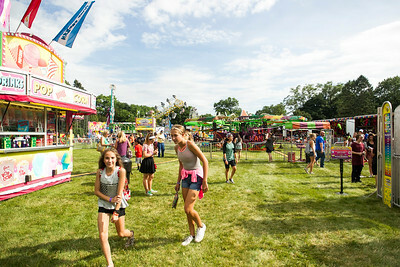 Sarah Nader - snader@shawmedia.com Hundreds pack the grounds during the 37th annual Lakeside Festival on Thursday, June 30, 2016 in Crystal Lake. The festival runs through Sunday and features, carnival rides, music, food, drinks and more. 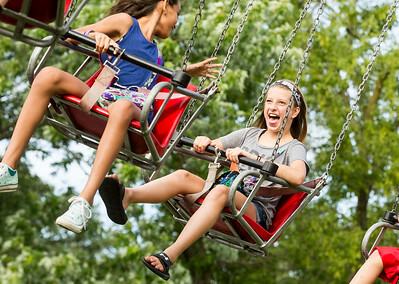 Sarah Nader - snader@shawmedia.com Bella Colandrea, 13, of Crystal Lake rides the swings during the 37th annual Lakeside Festival on Thursday, June 30, 2016 in Crystal Lake. The festival runs through Sunday and features, carnival rides, music, food, drinks and more. 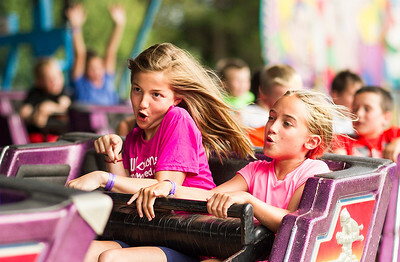 Sarah Nader - snader@shawmedia.com Evan Billimack (left), 10, of Crystal Lake and Elise Emery, 10, of Crystal Lake ride on a carnival ride while attending the 37th annual Lakeside Festival on Thursday, June 30, 2016 in Crystal Lake. The festival runs through Sunday and features, carnival rides, music, food, drinks and more. 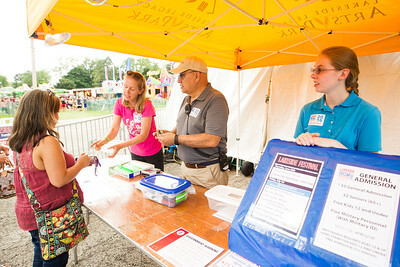 Sarah Nader - snader@shawmedia.com Volunteers Dottie Wege (left) of Crystal Lake and her husband, Dave Wege, check for wristbands at the entrance to the 37th annual Lakeside Festival while volunteering on Thursday, June 30, 2016 in Crystal Lake. The festival runs through Sunday and features, carnival rides, music, food, drinks and more. Sarah Nader - snader@shawmedia.com Volunteers Kim Cieslik (left) of Lake in the Hills Tony Gomez of Crystal Lake and Emma Cieslik, 17, of Lake in the Hills take payments for entry to the 37th annual Lakeside Festival on Thursday, June 30, 2016 in Crystal Lake. The festival runs through Sunday and features, carnival rides, music, food, drinks and more. 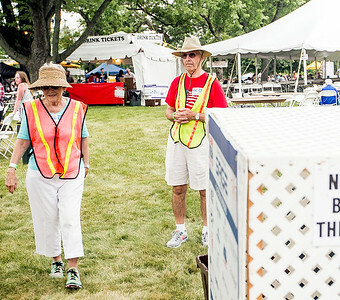 Volunteers Dottie Wege (left) of Crystal Lake and her husband, Dave Wege, check for wristbands at the entrance to the 37th annual Lakeside Festival while volunteering on Thursday, June 30, 2016 in Crystal Lake. 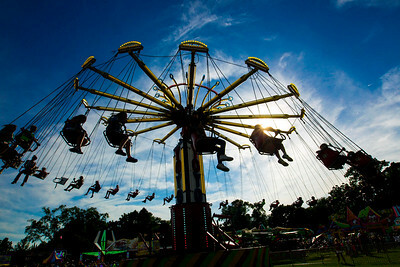 The festival runs through Sunday and features, carnival rides, music, food, drinks and more.